Hello everyone! 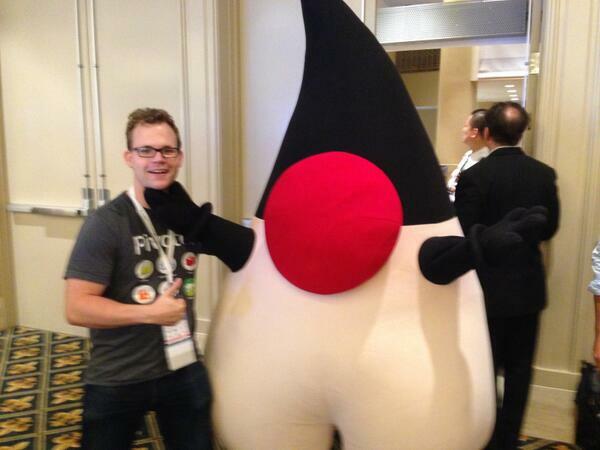 Pieter posting this on Josh Long's behalf here... this week the Spring and Cloud Foundry teams are at JavaOne talking to developers about Spring, Cloud Foundry, Hadoop and big data! 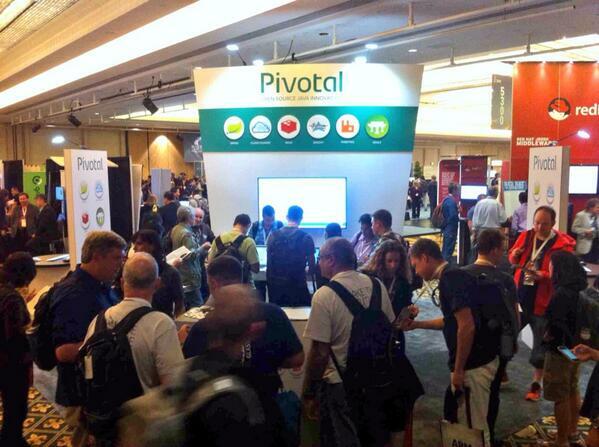 Happily, our pretty new @GoPivotal booth has garnered a lot of attention! I met Duke, too! I think the big guy was as happy to see me as I was him! Spring ninja Greg Turnquist put together a nice post on how to contribute to Spring Boot with a pull request. The article does ultimately talk about the processing sending a pull request, but most of it's a really great introduction to extending Spring Boot to suit a new use case (like JMS, which simply hadn't been added yet). This post also introduces some cool features in Spring Boot, if you haven't learned about it yet. Speaking of Spring Boot, check out this upcoming Spring Boot webinar featuring project co-lead Phil Webb! Rossen Stoyanchev put together a knock-out piece how to build web applications that use websockets, or Sock.js, and how to then layer STOMP on top of that for an easier messaging-style interaction between the browser and the service. Rossen also has an upcoming webinar on Oct 8th, Building WebSocket Browser Applications with Spring, showing off the best of his SpringOne2GX 2013 session. I encourage you to check out the upcoming webinar featuring James Williams on building big data applications with Spring, Spring XD and Hadoop! This is going to be an awesome talk. James has some killer examples and knows his stuff. In related news, I put together a quick post on my thoughts on Data Integration, Stream Processing and Spring XD. Jakub Kubrynski has put together a nice post on how to use load-time weaving to inject dependencies into objects not managed by the Spring container using a couple of different approaches. Nitin Kumar put together a nice look at Spring Integration, a lightweight approach. Tomás Lin, who says that he loves testing Grails applications with Spock, put together a great post on how to test with Spring Boot with Spock. Sometimes, you need to do RMI, and when you do, Spring has you covered! The BitwiseOR blog has a great post on how to use Spring Boot to build REST services, using Groovy no less! Win! I'm not sure if I agree with the conclusion, but whatever it takes for people to be able to use this to simplify development, it's a win! And, with really great posts like this, hopefully it won't be long at all before everyone's bootstrapping their development, too!